The Episode starts with Abhi coming to the auto stand and asks about Pragya. Auto driver tells that she came and asked to take to haveli near kailash, but I refused. Abhi thanks him. Nikhil’s goon Shanky comes to Pragya’s house and calls Nikhil. Nikhil thinks if he will tell Pragya that Kiarais with me. Shanki calls him again and asks can you hear me now? Nikhil asks him to return. Shanky says I will give the envelope to pragya or the person opening the door and will come. King comes and hears him. Nikhil thinks he can’t trust Shanky or anyone, and tells that he will give him half share of the ransom money, and asks him to make the video call and show him if he is giving courier to Pragya. Shanky says ok and is about to call Nikhil, when king catches him. He runs behind him and collides with a man who holds him. Shetty/angel uncle waits with Kiara for Pragya. Shanky signs him and sits in car. King catches him and asks where is Kiara? Nikhil tells other goon that Pragya is not picking the call and now is also not picking the call. He says he threatened to cut Kiara’s fingers. King asks Shanky to make a call to his boss. Shanky calls Nikhil. King takes the call and says if you do anything to Kiara then I will kill your goon. Nikhil asks him to kill him and says I will get benefitted. King asks him to come to his office with Kiara and says I will give you all money. Nikhil says I will not come to you. King says Abhi will not give you any money, but I will give you money. You will come to me because of your greed. He says if you don’t come, then I will give your info to Police and they will locate you. Nikhil gets tensed and agrees to come alone. King says ok.
Pragya gets down from the auto. Abhi is coming in his car and it stops midway. He gets down and calls Purab. He tells that Pragya went to Kailash greater and asks him to come and pick him, as his car stopped. Abhi’s battery gets drained before he could share his location. He comes to the road to ask for a lift and takes lift from Shanky, without knowing that he is the kidnapper. Pragya comes to the place and looks for Kiara. Tara rum pum plays….She calls Kiara. Kiara says mamma. Pragya sees her and gets happy. Kiara shouts Mamma. They could just meet each other because of the iron mesh. Pragya asks are you fine? Kiara says I want to go home. Shetty asks her to hurry up. He asks her to come from other door. Nikhil comes to meet King. King asks who are you? Nikhil tells that he is the one whom you called and asks what is the offer. King asks did you write this letter to Pragya. Nikhil says yes. King says if Kiara get even a scratch then he will make her small pieces. He says you want money inexchange of Kiara, and says I will give you double money. Nikhil says even Pragya will give me. King says you will not get any money as Abhishek will not give her money. He says if you do my work then I will give you 3 crores extra. Nikhil says this lottery is 6 crores. King says you will get the money if you do my work. Aaliya comes to King and tells that Bhai and your concert will not happen now. Nikhil hides his face and thinks how to go. King calls him Mr. Gupta and asks him to go. Aaliya stops Nikhil. King makes him go. Aaliya asks who was he? King says I met him for first time. Aaliya says you are lying. Peon asks Nikhil about a file. Nikhil says it is not mine. Aaliya couldn’t see her. Disha and Purab come to Abhi’s car, and couldn’t see him. Disha says he must have gone by walk. Purab says we will go to greater Kailash haveli. Shanky asks Abhi if he comes to know about his daughter. He thinks to inform Nikhil and thinks Shetty must have called Abhi. Aaliya is about to see Nikhil, but his mobile falls down and he bends down to pick his mobile. Aaliya don’t see her. Precap: King deals with Nikhil and asks him to handover Kiara to him. He then book tickets for Kira and him. Abhi threatens Tanu to get her arrested. 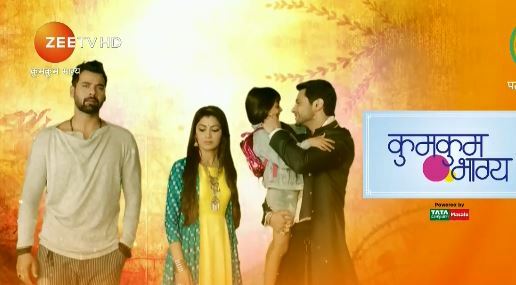 The post Kumkum Bhagya 8th March 2019 Written Episode Update: Pragya meets Kiara appeared first on Telly Updates.